Milčo Mančevski establishes new guidelines for independent movie makers, successfully balancing between Hollywood commercial and the independent art film. Only few compromises and hybrids like this have proven worth filming (and watching) and I was pleasantly surprised with the outcome. First of all, there was the careful choice of names - Luke and Elijah (biblical names) opposed to the prostitute Lilith (female demon). No wonder that Lilith was in so many ways connected with water and finally she drowned. Than, there's Neda (from an old Macedonian poem "Serdarot" by Grigor Prličev, awarded first prize at Athens). Then, a thing which impressed me was the short appearance of certain characters like Sigmund Freud, Pablo Picasso and Josip Broz Tito. 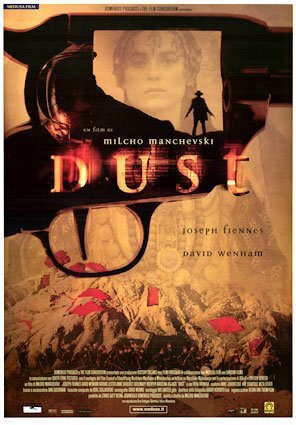 Mančevski has used his old "trick" from his first film "Before the Rain" - non-linear time, but while in "Before the rain" the explanation was "The circle is not round, time never dies" in "Dust" it is "The centuries do not follow up each other but coexist like parallel universes". Repentance was an important motif in the movie, especially the repentance of Luke and Edge. Certain scenes have moved me, the scene in the hospital when Angela dies and the nurse is asking Edge what is he to her... The scene in Macedonia, when the women are laundering the carpets on a rocky waterfall (Mariovo)... And another thing - me as a Macedonian have always been brought up with the notion that our freedom fighters were noble men who were usually victims of blood thirsty Turks, but this movie had an interesting point that they were all butchers and murderers whose only lust is not freedom or fight against oppression but GOLD! Probably this movie doesn't have the prophetic touch of "Before the rain" clearly displayed in the current political situation in Macedonia, but there's again the scene with Albanian gangs killing innocent Macedonian cattle breeders. And another thing - both Angela and Luke are mocking the official clerical (church) "authorities", when Angela refuses the confession of the catholic priest on her death bed and when Luke kills the local orthodox priests offering assistance in the negotiations with the Turks (by the way, the priest is a traitor, which questions another illusion of mine and my generation - that the priests and the Church have been very active in protecting the Macedonian villagers from oppression and torment). I know one thing for sure - that as soon as I am able I will use my proud privilege to be a Macedonian and visit Mariovo, where a part of the movie was made, and especially the bridge where the Turks attempted to pass so many times during the 17-th century and did not succeed. The tension seems to fade at some points and that's why the rate of "9" form my user's vote, but still, this is an excellent complete product, made with the touch of perfect craftsmanship.